Derek Collins on Irish born governors of British ruled Hong Kong. The 18th Royal Irish Regiment storming the Chinese forts at Amoy during the Opium War. Hong Kong became a colony of the British Empire after the First Opium War (1839–42). 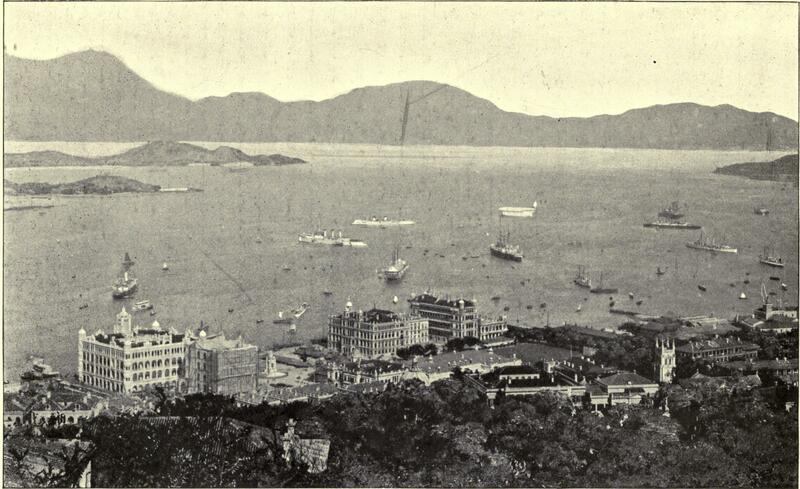 Hong Kong Island was first ceded to the UK in perpetuity, followed by Kowloon Peninsula in 1860 and then the New Territories was put under lease in 1898. It was occupied by Japan during the Pacific War (1941–45), after which the British resumed control until 1997, when China resumed sovereignty. The earliest recorded European visitor was Jorge Álvares, a Portuguese explorer who arrived in 1513. After establishing settlements in the region, Portuguese merchants began trading in southern China. The East India Company made the first sea venture to China in 1699, and the region’s trade with British merchants developed rapidly soon after. In 1711, the company established its first trading post in Canton. By 1773, the British reached a landmark 1,000 chests of opium in Canton with China consuming 2,000 chests annually by 1799. 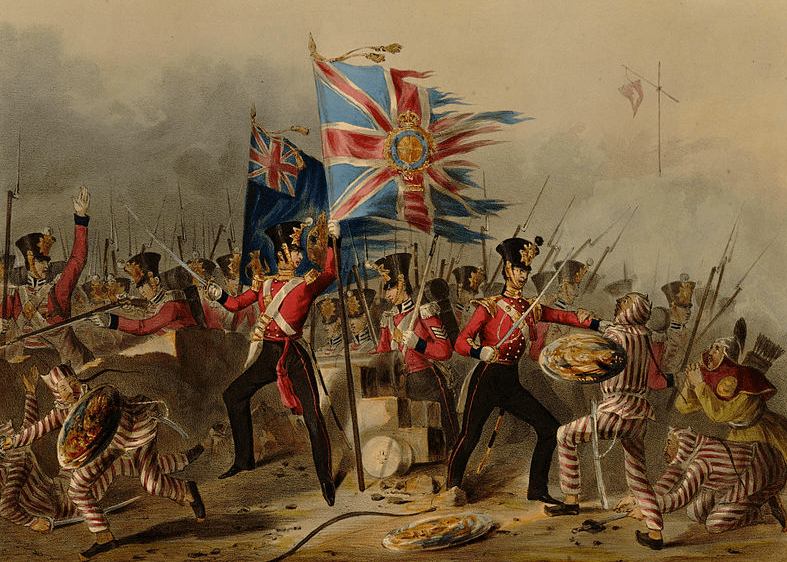 In 1839, the refusal of the Qing dynasty authorities to sanction imports of opium (the emperor was tired of poor Chinese people getting addicted) resulted in the First Opium War between China and Britain. Hong Kong Island was occupied by British forces on 20 January 1841 and was initially ceded under the ‘Convention of Chuenpee’ as part of a ceasefire agreement between Captain Charles Elliot (a British Navy officer, born in Dresden) and Governor Qishan, but the agreement was never ratified due to a dispute between high-ranking officials in both governments. It was not until 29 August 1842 that the island was formally ceded in perpetuity to the United Kingdom under the ‘Treaty of Nanking’. The Governor of Hong Kong chaired the Executive Council and appointed most of the colony’s legislature. Authorities and duties of the Governor were defined in the Hong Kong Letters Patent and Royal Instructions in 1843. The Governor, appointed by the British monarch (on the advice of the Foreign Secretary), exercise the executive branch of Hong Kong Government throughout British sovereignty and, with the exception of a brief experiment after World War II, no serious attempt was made to introduce representative government, until the final years of British rule. The Governor of Hong Kong chaired the colonial cabinet, the Executive Council (ExCo), and until 1993, also the President of Legislative Council. The Governor appointed most, if not all, of the members of the colony’s legislature, (known colloquially as LegCo), which was largely an advisory body until the first indirect elections of LegCo was held in 1985. Initially both Councils were dominated by British expatriates, but this progressively gave way to local Hong Kong Chinese appointees in later years. Historically, the Governors of Hong Kong were professional diplomats, save the last Governor, Chris Patten, who was a career politician. Nine of the 28 governor had Irish connections. Predominantly they were from an Anglo-Irish background. Some of the twenty eight Governors had Irish roots, mostly of Anglo-Irish Protestant background, one had a Catholic upbringing, another an atheist. Their ancestors were country squires in long possession of ample and prosperous estates. Many streets, buildings and hills are called after these men, all across the old British Empire, and Hong Kong is no exception to this. They shaped much of Hong Kong’s character as it is today. They joined the Colonial Service usually from their Legal, Naval or Army Service background, and had experience in many parts of the world in diplomatic roles. Given their background and upbringing with their duties to their land tenants, were they ideally suited to govern a colony, would they be sensitive to cultural customs in various parts of the world? Would their various posts bring new ideas or spread of The Empire’s Ethos? Hong Kong was one of the many posts on the diplomatic journey, and they left behind various legacies. Under their tenure a lot of Hong Kong’s infrastructure, currency, banking, police and prison structures were established. 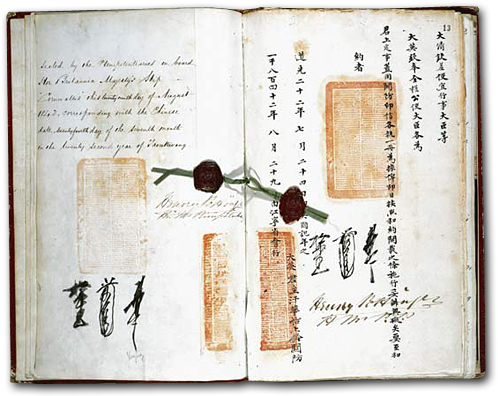 Henry Pottinger the Irish born first governor of Hong Kong’s signature on the Treaty of Nanking. The first governor of Hong Kong, he was born at Mount Pottinger, County Down, in the north of Ireland, in 1789, the fifth son of Eldred aka Edward Curwen Pottinger Esq., of Mount Pottinger, County Down, and his wife Anne Gordon, daughter of a minor landowner, Robert Gordon, Esq. of Florida House, Co. Down. The Pottingers were a merchant family, based in Belfast for generations. He was sent to Hong Kong in 1841. Pottinger is remembered as the British general to have won the First Opium War and claimed Hong Kong as a British colony; the lead negotiator and signatory of the Treaty of Nanking (1842); the first governor of Hong Kong and one who established the Legislative Council in Hong Kong. During his very short tenure, Pottinger established executive and legislative chambers, with one discussing political affairs and one designing legal codes. However, the chambers did not convene often, and this gave Pottinger wide-ranging powers to decide on policy. 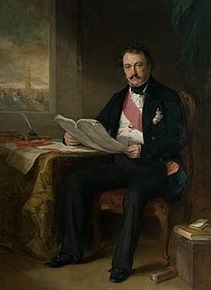 Lord Aberdeen—the Colonial Secretary— wrote to Sir Henry Pottinger—the Colony’s first official governor—in 1843, that Hong Kong could easily become a credit to the Crown if by “the introduction of those liberal arrangements by which foreigners would be encouraged to come, a great commercial entrepôt were created”. Pottinger obeyed, establishing Hong Kong as a free port opened to all comers, regardless of race, class, or nationality—though with a hint of the vacillation to come, it took a supplementary treaty in 1843 to open up the colony to Chinese merchants. Towards the end of his tenure, Pottinger lost the support of the local British merchants and was isolated. He left on 7 May 1844. By the time of his departure it was arguable whether the British in Hong Kong disliked Henry more, then Henry disliked them, but the antipathy was mutual. Robinson a younger son of landlord family from Westmeath was the youngest governor in Hong Kong history at 35. He was born at Rossmead, Co. Westmeath, Ireland, son of Admiral Hercules Robinson and Frances Elizabeth Wood. He was a 2nd Lieutenant with the Irish Fusiliers, but in 1846, the post-famine enforced sale of his family’s estates led him to supervise relief works for the victims of the Great Irish Famine (1845-48). It was the quality of his work here that was the start of his meteoric rise, up through the ranks of various colonial posts. In 1846, through the influence of Lord Naas, Robinson obtained a post in the Board of Public Works in Ireland, and subsequently became chief commissioner of fairs and markets. When he was appointed governor of Hong Kong in 1859, he was at age 35 the youngest governor in Hong Kong colonial history. He was very focused on improving the infrastructure of Hong Kong. The great achievement of Hercules George Robert Robinson was to establish a system for future recruitment of Hong Kong administrators. Such a program was urgently needed, as only four men in his administration was familiar with Cantonese. It was during his administration that HSBC was established in Hong Kong. This began as a representative body of merchants that later incorporated themselves as the Hong Kong and Shanghai Banking Corporation. He ensured the provision of a steady supply of water for the people of Hong Kong from the development of Pok Fu Lam reservoir. He established Towngas, to provide for the lighting of the streets. The 6th Governor of Hong Kong, Sir Richard Graves MacDonnell was born in Dublin on September 8, 1814, son of Rev. Richard MacDonnell – the Provost of Trinity College Dublin – and his wife Jane Graves. His mother was one of the Graves family of Limerick who had come over from Yorkshire in Cromwellian times. His father’s family came from Cork and both families were part of the ascendency. After a strict upbringing in an Irish Protestant family, Richard Graves MacDonnell attended Trinity College, where he graduated ba (1835), ma (1836), llb (1845), and lld (1862). Called to the Irish bar in 1838 and admitted to the English bar at Lincoln’s Inn in 1841, his professional career took him in July 1843 to the colony of Gambia, in West Africa, as Chief Justice. During his time as governor of Hong Kong, he developed much of Victoria Peak as the premier residential quarters of Hong Kong, albeit only accessible to rich European merchants. To his credit, he also ordered the construction of a hospital whose focus was to tend to the needs of the local Chinese population. Unfortunately, it does not seem that managing money was his forté, the huge deficit that was run up by his administration meant that he had to go cap in hand to HSBC for a financial aid package. He was described as ‘naturally authoritative, fond of adventure, and intolerant of idleness and humbug’. Somewhat reluctantly acknowledged as one of the finest Governors in service, he irritated the grandees of the colonial office by addressing them in a coarse manner. MacDonnell knew his law and he ran Hong Kong personally not relying on his staff and not caring too much for public opinion. Right or wrong, he pulled the colony, Chinese and Europeans, together as a working unit, like no other before him. The most controversial of MacDonnell’s innovations was his licensing of gaming establishments. 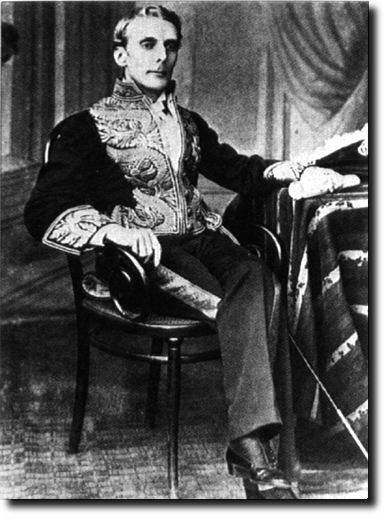 Sir Arthur Edward Kennedy (1809-1883) – the 7th Governor of Hong Kong – was born in Cultra, Co. Down, son of Hugh Kennedy & Grace Dorothea Hughes. He met his predecessor, MacDonnell, when he attended Trinity College, Dublin. Kennedy originally from County Down served in the British Army and showed a conservative paternalistic outlook as an administrator. During his youth and young manhood, Arthur was influenced by several strong currents of thought that showed plainly in his later life. His class assumed that it was possessed of a monopoly of political wisdom. His outlook was therefore never democratic. Rather was it inspired by a belief that he was responsible for the welfare of people placed under his care. He was well regarded in Ireland for his work in the aftermath of the Irish Famine. He had worked with the Poor Law Commission to administer relief to the citizens of Co. Clare. Kennedy entered the British Army, and was gazetted an Ensign in the 11th Foot on 15 August 1827. Until 1837 he served with infantry regiments on Corfu. He spent 1838–1839 and 1841–1844 in British North America. In 1841 he purchased a Captaincy in the 68th Foot. Kennedy returned to Ireland in 1846, and the following year sold his captaincy and took up an appointment with the Poor Law Commission. His job was to administer relief to the many inhabitants of County Clare who were affected by the Potato Famine. He was shocked by what he saw and had serious differences with the local Landlord, Colonel Crofton Moore Vandeleur. In 1872, Kennedy was appointed the 7th Governor of Hong Kong, a position in which he served until 1877. During his tenure, he created the Hong Kong dollar, which served as the unitary monetary unit for the territory. Since this time, the Hong Kong dollar has (albeit with a short period of disruption) served as the single monetary unit for the entire territory. He also developed Kennedy Town, the western end of Victoria City on the Hong Kong Island. Sir Arthur’s style of governing was to do as little as possible and to be nice to everyone. ‘Don’t rock the boat’ became a cornerstone of Hong Kong’s political philosophy. Hong Kong prospered during this period. On his resignation as Governor of Queensland, Kennedy boarded the ‘Orient’ with the intention of returning to England. On 3rd June 1883, when the Orient was off Aden in the Red Sea, Kennedy died. He was buried at sea. 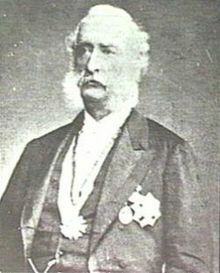 Sir John Pope Hennessy, was a colonial administrator who served as the eighth Governor of Hong Kong. He was born on 5th of April in 1834 in Ballyhennessy, Co. Cork, attended Queens University in Belfast and died in 1891. Unilke the other Irish governors of Hong Kong, he was born a Catholic, with a liberal political tilt, he was often on the side of the underdog. Although born into the Anglo-Irish landowning aristocracy, Hennessy’s status as a Roman Catholic made him something of an outsider, particularly in his dealings with Protestant British colonial elites, whether in Barbados, Hong Kong, or Mauritius. He was Governor of Hong Kong 1877-1882. His personal motto was summed up in his Three Grand Qualifications to Success: The first is audacity, the second is audacity, and the third is audacity. In his time, he was judged harshly by his European peers, in some measure because he did not run things in a manner that best served their personal interests, but history may be kinder to his reputation. Kenneddy, the only Catholic governor was from County Cork, he was regarded as the most liberal of the governors towards the Chinese population. It is written that he was unsuited to the role, a diminutive and arrogant Irishman, Hennessy had great charm, and an innate sympathy for what he believed to be the underdog, but almost a complete lack of commonsense, method, reliability, tact, or management skills. He was a political appointment, awarded by a Tory Government to a former Tory MP. A Tory Irish nationalist and a Catholic to boot, he was a rare creature. Hennessy found himself in debt and saddled with two illegitimate children. He was saved by the Tory victory in 1866, when Disraeli , an admirer of Hennessy’s undoubted panache, promised to find him a ‘lucrative but quiet governorship’. He was a far from popular figure, among the colonial community. As a result of his name of Pope Hennessy his nickname was ‘his holiness’ and the road was named after him 46 years after he had left. His wife was a half Malay, Eurasian, so the racism, that was common at the time, would have affected him too, personally, had not his wife been the governor’s wife. During his tenure, Hennessy realised that the Chinese people, who were treated as second-class citizens up to that time, had developed an increasingly important influence on the Hong Kong economy. With that in mind, he lifted the ban that forbade Chinese people from buying lands, constructing buildings, and operate businesses in the Central District. This caused a development boom in the Central District. Also, he allowed Chinese people in Hong Kong to become naturalised subjects of the UK. He appointed the first Chinese member to the Legislative Council of Hong Kong, Wu Ting fang, who would later become the Minister of Foreign Affairs of the Republic of China. Hennessy also reformed the prison system, including stamping out public flogging and branding on the neck that tended to force victims to become permanent unemployable criminals. But his leniency led to an upturn of crime. Having had two illegitimate children by his mistress Miss A. M. Conyngham, Hennessy married Catherine Elizabeth (“Kitty”) Low, daughter of Sir Hugh Low. They had three sons, the eldest being Richard Pope-Hennessy. Sir George Ferguson Bowen was born the eldest son of the Rev. Edward Bowen, rector of Taughboyne in County Donegal. Bowen was educated at Charterhouse School and Trinity College, Oxford. He was the first Governor of Queensland and then was Governor of New Zealand before on 30th March 1883, Bowen was made Governor of Hong Kong. During his tenure, his administration established the Hong Kong Observatory, which also served as the meteorological institute of the territory. Brown, son of a Rector from Donegal founded the first college in Hong Kong in the 1880s. He founded the first college in Hong Kong, and ordered the construction of the Typhoon Shelter in Causeway Bay, and a government hospital. He retired in 1887, due to ill health. It was written that at a time of international tension, Hong Kong had to put up with a weak and nervous Governor. George Bowen was a polished example of smooth pomposity, who had glided swiftly through the ranks of colonial administration. By the time Bowen arrived in Hong Kong in 1883, according to one commentator, he had developed into ‘a consummate bore, idle, inordinately pleased with his lofty acquaintances and immensely conceited’. George Ferguson Bowen died on 21st February 1899 in Brighton in Sussex, aged 77 years old. Sir William Des Vœux’s Irish roots often get ‘missed’ as he was born in Germany (Baden-Baden). He was the 7th child of an Irish minister serving in Germany at the time of his birth, but his father, as well as the first six children, were all born at the ancestral home in Portarlington, Co. Laois. He was of French descent – his ancestor Marin de Bacquencourt Des Vœux settled in Portarlington, Ireland, in the early 18th century, having come from Picardy in northern France. William Des Voeux was born in Germany to an Irish Protestant father, though he was by conviction an atheist. His ancestors were Huguenots who settled there after the revocation of the Treaty of Nantes. At first, Des Voeux thought he might be a farmer, maybe in Canada, but instead by his mid-20s he took the bar exam in Toronto. His Huguenot roots probably helped to inform his approach to the religious divide. When he served as a Governor of Newfoundland, at a time of tensions between Catholics and Protestants, he attended a different church each Sunday, in spite of the fact that he personally was an atheist. In 1887, Des Vœux was appointed as the tenth Governor of Hong Kong, a position he held until 1891. This would be the last post Des Vœux would hold in the Colonial Services. Des Voeux passed laws barring non-Europeans from living in parts of Hong Kong. Unfortunately, the wisdom that he showed when it came to religious divisions did not seem to translate into him choosing to heal ethnic divisions in Hong Kong. In the case of The Peak, he passed the European Reservation Ordinance in 1889. This meant that he effectively barred non-Europeans from living there. On the plus side, it was under his watch that the Hong Kong Electric Holdings was established, and the Peak Tram began operation. Des Voeux was more restrained than his predecessors mainly due to ill-health, but he kept his energy for visiting celebrities. The Comte de Bardi occupied a great deal of his time. Hardly a figure of international importance, the count was a Bourbon, and owner of the Chateau de Chambord, to which return visits would be welcome. Sir William was forced however to give his attention to the less attractive subject, public health. Des Vœux died in London on 15th December 1909. Sir Arthur Henry Blake, the 12th Governor of Hong Kong, was born in Limerick, Ireland on 8th January 1840. His parents were Jane Lane (Lanespark, County Tipperary) and Peter Blake, born in Corbally Castle Galway and employed as inspector of the Irish Constabulary. Young Arthur had a humble start, as a draper’s assistant at a haberdashery, then joined the Irish Constabulary in 1859, where he worked as an inspector and Resident Magistrate of Duff. In 1876 he was appointed RM to Tuam, an especially disturbed district in the west of Ireland, where he was noted as judicious and active. In 1882, he was promoted to Special Resident Magistrate. Blake, though known as a ‘cordial Irishman’ subjugated resistance to British rule in ‘New Territories’ with troops. In 1884, Blake was made Governor of Bahamas, a position he held until 1887. In this year, he moved to Newfoundland, where he was governor until 1888/9. In 1898 he was appointed Governor of Hong Kong, a position he held until 1903. Five months before he arrived in Hong Kong, the British Government negotiated an agreement with the Imperial Chinese Government allowing the Hong Kong Government to lease the New Territories for 99 years. He was a large, cordial Irishman with all the qualities of humanity that Pope Hennessy possessed. During Blake’s tenure, he sent in administrators to the New Territories to assert control. The residents of the area organised a tough resistance movement, which was subdued with the use of British troops under Commander Gascoigne. Blake and James Haldane Stewart Lockhart (a Scot, and Colonial Secretary), did not see eye to eye. On the same night that the British took over The New Territories, three Chinese villagers were murdered. Lockhart dealt with the crime by burning the suspects’ houses and fining the village. Blake criticized; ‘we have come to introduce British jurisprudence, not to adopt Chinese ways’. Blake left Hong Kong immediately after he attended the inauguration of the Supreme Court building (now the LegCo Chambers) in 1903. He died on the 23rd of February 1918 in Youghal , Co. Cork, at Myrtle Grove. Blake arrived in Hong Kong in November 1898 with his second wife Edith. His first wife Jeanne Irwin, had died after four years of marriage, and in 1874 he married Edith Bernal, daughter of a wealthy Irish family. His daughter Olive, who married John Bernard Arbuthnot, aide-de-camp the Governor. Blake and his wife were keen botanists. bauhinia blakeana, the official flower of Hong Kong and is on the Hong Kong flag today, was named in Blake’s honour. Sir Francis Henry May was a long-time colonial administrator who became the 15th Governor of Hong Kong 1912-1919. (It was also his last post in the Colonial Service). May was born in Dublin, Ireland on 14th March 1860. He was the 4th son of Rt. Hon. George Augustus Chichester May, Lord Chief-Justice of Ireland. May was educated at Harrow School and Trinity College, Dublin, where a few of his predecessors to the Governorship of Hong Kong attended school. May received the 1st Honourman and Prizeman Classics and Modern Languages and B.A. in 1881. In 1881, May was appointed to a Hong Kong Cadetship after a competitive examination. In 1886, he became the Assistant Protector of Chinese and private secretary to Governor Sir George William Des Vœux. He was also the private secretary to Acting Administrator Digby Barker from 1889 to 1891. May was the Captain Superintendent of the Hong Kong Police Force, and Superintendent of Victoria Gaol and Fire Brigade between 1896 and 1902. One of the Irish men founded and headed up the Hong Kong Police force for its first 50 years. May was the only Hong Kong Governor to be the target of an assassination attempt. He was fired upon near the General Post Office as he rode in a sedan chair after arriving from Fiji in July 1912. May was not injured; the bullet lodged in the sedan of his wife. The gunman, Li Hung Hung, had a grudge against May. Several years before, this former Police Superintendent had imprisoned Li’s father, an ‘undesirable’ mainland immigrant. Since that incident, May used an automobile as his daily method of transportation. On 22 January 1918, May personally negotiated with the remaining member of a gang holed up in the “Siege of Gresson Street”, Wanchai, following a running gun battle through the streets of Wanchai in which five police officers were killed, including Irish Police Inspector Mort O’Sullivan. May married Helena Barker in 1891. She was the daughter of Acting Administrator Major-General Digby Barker. They had four daughters, Stella, Phoebe, Dionne and Iris. He died at Clare Priory, Suffolk, England. He is buried at Clare. 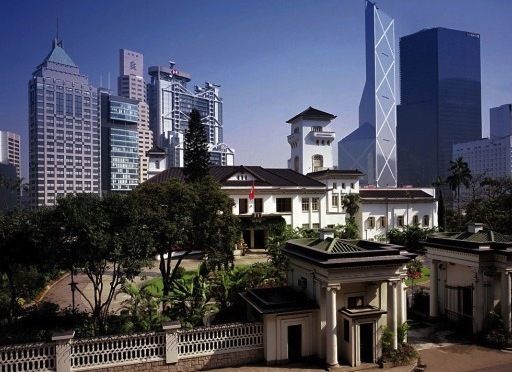 ‘Government House’ in Hong Kong today. British colonial policy, from its painful evolution in the first decades of the nineteenth century, has remained tolerably liberal, and a succession of mostly decent Governors and administrators have applied it well. The British finally left Hong Kong in 1997, ceding it as an autonomous province, to the People’s Republic of China. Nevertheless, Hong Kong has been shaped by 156 years of British rule – a legacy Hong Kongers still debate. British rule in Hong Kong could be progressive and liberal but also violent and racist. Hong Kongers today struggle to reconcile this legacy. They enjoyed the western infrastructure, schools, hospitals, low tax, some form of freedoms, political stability and other things British rule brought. Chinese Mainlanders envy and resent these advantages and there is tension with mainlanders over range of issues, from baby food formula to overcrowding on the Underground But all these things came at a price. Hong Kong was a Colony and some of Hong Kongers’ ancestors were treated badly, especially prisoners. Nine of the Governors had Irish connections, and they played their part in shaping this amazing city and region today, some more than others. So how can their legacy and that of Britain in Hong Kong more broadly, be summed up? According to historian Christopher Munn, John Pope Hennessy and MacDonnell’s, policies “were essential preconditions for the apotheosis of the Chinese bourgeoisie during the Hennessy years”. Hennessy pioneered an embryonic partnership between Chinese élite groups and the colonial government. But it would be wrong to conclude that British rule was all liberalism and progress. Hennessy found on his arrival that Chinese prisoners where flogged, sometimes fatal, and tattooed and deported to China – a policy that fellow Irishman Richard Graves MacDonnell had introduced, that Europeans did not have to endure. What was more, Hennessey’s successor fellow Irishman, George Bowen, reversed a number of these reforms to moderate the brutal penal system, and approved floggings of prisoners as young as 12 for minor offences. Similarly Des Voeux introduced the European District Reservation Ordinance which reserved parts of the up-land area of Victoria (The Peak) solely for houses built by European design. He did not view this ordinance as racist, but it opened the door for more divisive legislation under successive governors. In closing it may have to suffice to say that Hong Kong’s experience of British colonialism encapsulated many of its contradictions – economic progress and liberalism but also on occasion racism and rule by force. It is a legacy with which Hong Kong continues to contend today. Derek Collins is involved with the Irish Chamber of Commerce in Hong Kong, and has a keen interest in the characters that shaped HK over the years. Anglo China -Chinese People and British Rule in Hong Kong, 1841-1880, Christopher Munn.